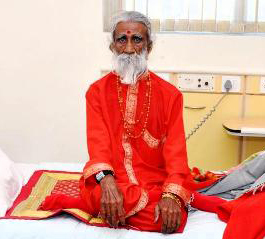 Prahlad Jani, an 82-years-old man who claims that he has not had any food or drinks for more than 70 years. His claims were in fact put to test at a hospital in Ahmedabad, India. Doctors monitored him closely, and he was also studied by India's Defense Research Development Organization, which believed that Prahlad have a quality that can help save lives. At the hospital he spent six days without food or water under the strict observation of scientists and doctors who said that his body did not show any signs of hunger or dehydration. Jani is a Yogi who lives an enforced spiritual life alone. He believes that his energy body is inhabited sustained by the spirit of a goddess. My explanation is that Prahald jani have fully activated his energy body, and awakened his kundalini energy. He now knows how powerful a human being can be. due to religious backgrounds, Mr.Jani may believe that a goddess is taking care of him. If he was a christian he would have believed that Jesus is taking care of him! In fact no one is taking care of him, he is just taking real good care of himself! He walks in the light of God, fully connected to source. "If Jani's claims are verified, it will be a breakthrough in medical science," said Dr G Ilavazhagan, director of the Defense Institute of Physiology & Allied Sciences. "We will be able to help rescue human lives during natural disasters. We can educate people about the survival techniques in adverse conditions with little food and water or nothing at all." In fact, i do not think that physical science can explain Jani's ability, scientists can study him for years if they like, but what they do not realize is that what Jani is experiencing is completely beyond any physical explanations that we know of. Thank You!